When it comes to my car, I’m a perfectionist. I can’t cut corners; anything I fit has to be the best. It has to be functional, of course, but even better if it is beautifully made and great to look at. Richard Oakes is an automotive designer and constructor with a world-wide reputation. He makes an exclusive range of superb stainless-steel handbrakes. They are designed for a variety of applications and are for high quality specialist car builds, modified cars and restorations, where every last detail must be right. standard throughout and they are supplied with stainless fixings and mounting hardware. A unique feature of these special handbrakes is their smooth-action trigger release. They are made in England for constructors and car modifiers everywhere and are available in four types to fit various applications and for specific cars. 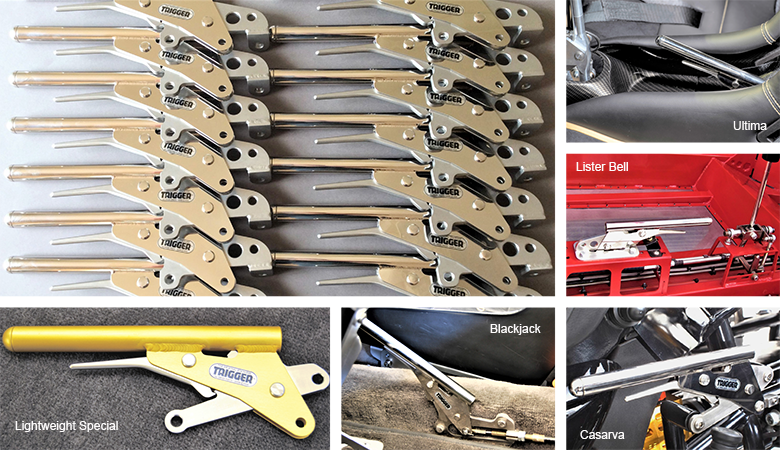 A Trigger Handbrake is a ‘must-have’ for any serious car builder or modifier. Click here to see our Terms & Conditions , Returns , Privacy and Security Policies.